I wish to add an ASP.NET Web API to an ASP.NET MVC 4 Web Application project, developed in Visual Studio 2012. Which steps must I perform to add a functioning Web API to the project? I'm aware that I need a controller deriving from ApiController, but that's about all I know. Add App_Start\WebApiConfig.cs (see code snippet below). Import namespace System.Web.Http in Global.asax.cs. Call WebApiConfig.Register(GlobalConfiguration.Configuration) in MvcApplication.Application_Start() (in file Global.asax.cs), before registering the default Web Application route as that would otherwise take precedence. Add a controller deriving from System.Web.Http.ApiController. I could then learn enough from the tutorial (Your First ASP.NET Web API) to define my API controller. 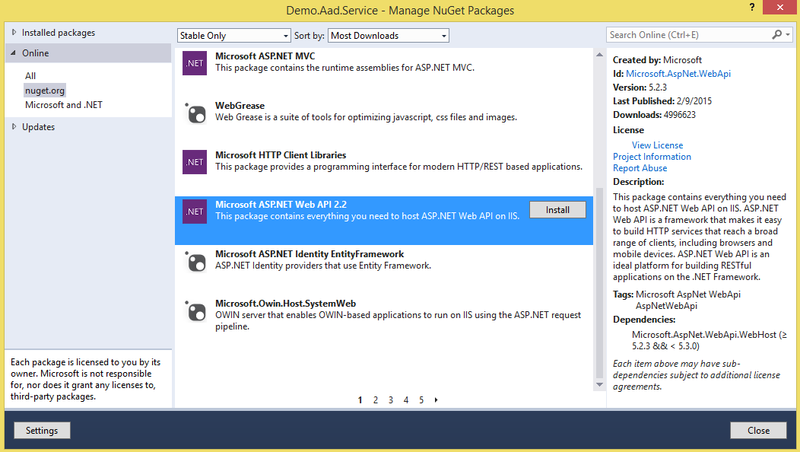 Word has it, the NuGet package Microsoft.AspNet.WebApi must be installed for the above to work. To add WebAPI in my MVC 5 project. Visual Studio has added the full set of dependencies for ASP.NET Web API 2 to project 'MyTestProject'. The Global.asax.cs file in the project may require additional changes to enable ASP.NET Web API. Before you start merging MVC and Web API projects I would suggest to read about cons and pros to separate these as different projects. One very important thing (my own) is authentication systems, which is totally different. IF you need to use authenticated requests on both MVC and Web API, you need to remember that Web API is RESTful (don't need to keep session, simple HTTP requests, etc. ), but MVC is not. To look on the differences of implementations simply create 2 different projects in Visual Studio 2013 from Templates: one for MVC and one for Web API (don't forget to turn On "Individual Authentication" during creation). You will see a lot of difference in AuthencationControllers. Note: The solution works with Visual Studio 2013 or higher. The original question was asked in in 2012 and it is 2016, therefore adding a solution Visual Studio 2013 or higher. Not the answer you're looking for? Browse other questions tagged asp.net-mvc asp.net-mvc-4 asp.net-web-api visual-studio-2012 or ask your own question. How to add Web API to an existing ASP.NET MVC (5) Web Application project? No ASP.NET MVC 5 Web Application Template on VS 2012?